Practice a slow steady rhythm and avoid deep breathes and sighs. Try to focus on your breath at least once per hour throughout the day—it typically takes at least several weeks to automatize to a new breathing pattern. The main goal of respiratory training is to move from a chest breathing to a belly breathing strategy that allows for outwards motion of the lower ribs. It’s best to begin laying down on your back with knees bent. Belly breathing vs. chest breathing: place one hand on your stomach and one hand on your chest and notice your breath. Notice, which moves more. If the abdomen predominates its normal if the chest predominates it is not. Lateral rib motion: place one hand on each side of the lower ribs and notice the breath. Also notice if there is motion in the outer ribs during inspiration and expiration. There should be a lateral (side to side) motion vs. an up and down motion. Basic awareness training: The abdomen should move inward during exhalation and outward during inhalation. The lower ribs should close during exhalation and widen during inspiration. The ribs should open and close without lifting up. 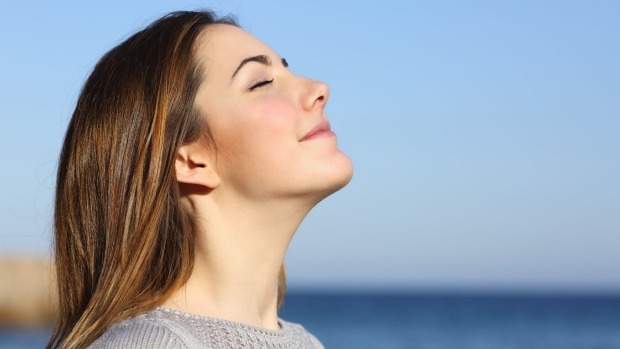 As you get more comfortable with this breathing pattern try to lengthen the exhalation. As the breath relaxes and deepens over time the exhalation should take approximately twice as much time as the inhalation. The goal is to relax the breath to six to eight cycles per minute with a 7-8 second exhalation and a 2-3 second inhalation. Coordinating breathing with bracing: place your hands on your obliques (outer ab muscles) and perform an abdominal brace with 10% maximal effort, while maintaining a normal pattern of breathing. An abdominal brace can be achieved by tensing your entire abdominal wall. Think about tensing your abs as if you were going to be punched in the stomach. This should not involve pulling the belly button in or down.